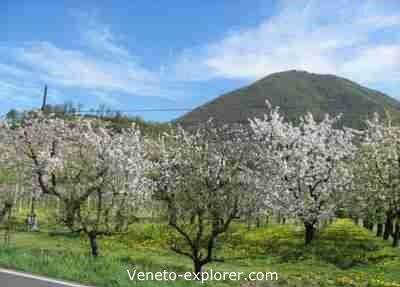 A holiday in Veneto, Italy. 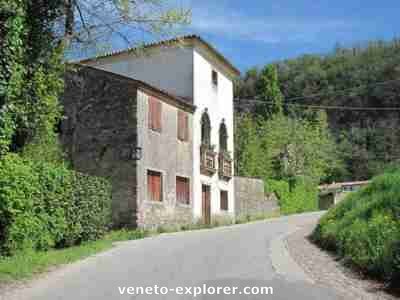 Want a relaxing holiday in Veneto, Italy, away from the crowd and surrounded by a paradisiac setting in a bucolic atmosphere? Arquà Petrarca, located about 40 minutes south of Padua, is one of the most well preserved among the medieval towns and villages both of Veneto and Italy, having kept all its medieval flavour both inside the hamlet and in the surrounding landscape. It’s not by accident that it was certified by the prestigious Touring Club Italiano with the so called Bandiera Arancione seal (orange flag) as one of the most beautiful Medieval towns of Italy. While getting there you’ll drive across the picturesque cone-shaped Colli Berici, or Euganean hills, feasting your eyes with an enchanting landscape dotted with orchards – in spring you’ll enjoy a blaze of white among thousands of blooming cherry trees – olive groves and typical farms, sometimes turned into trattorie, agriturismi or bed and breakfast. Just driving across the Euganean hills is a pleasure in itself, and visiting Arquà Petrarca, located at the top of one of many hills, will be just the icing on the cake. This medieval hamlet lies in a bucolic setting apart from the main communication routes, and its remoteness just helps keep its unique medieval atmosphere. 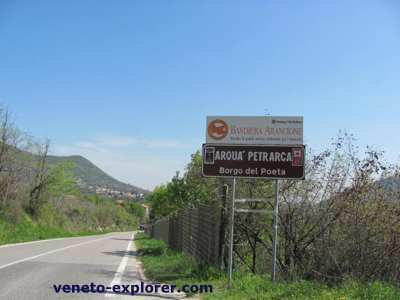 So, do not absolutely miss Arquà Petrarca if you wish a romantic and reasonably off-the-beaten-path holiday in Veneto. The last part of the village name comes from the Tuscan Francesco Petrarca, a significant exponent of the Italian poetry and literature in the Middle Ages. 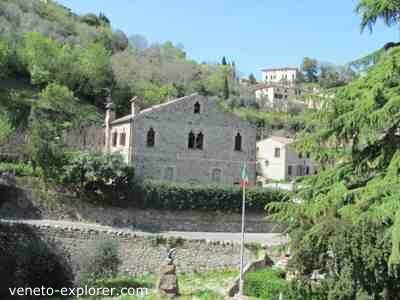 In 1370, in occasion of his healing retreat in the thermal area of Abano Terme (nowadays a still renowned Spa area), at the foothills of the Euganean hills, he got to know this charming village, quickly falling in love with it. He bought a house and settled there, where he spent the last 4 years of his life. In a document Arquà Petrarca is described at the time of the poet as a place with wide variety of trees such as beeches, chestnuts, ashes, durmasts covering the slopes of Arquà, but most of all it was the vine, the olive tree and the almond tree that concurred to create the evocative typical landscape of Arquà. Maybe the poet Petrarca chose to live there as this place reminded him of his beautiful Tuscany. The center of the restful village is piazza Roma, lined with aristocratic palaces dating back to the 1300’s and 1400’s. The church of Santa Maria Assunta – built in 1020 – overlooks the small square, and hosts fine medieval frescoes. In the churchyard stands the mausoleum of Petrarca, made up in red marble of Verona. If you take a look downward at the road from the churchyard you can see an ancient fountain and, in a more elevated location, the elegant Villa Pisani. From Piazza Roma walk towards Arquà Alta, the upper old town. You can reach it either by walking along via Roma, which is lined with interesting buildings – among others a 14th century beggars’ hospice - or by climbing up the steep steps which start not far from the fountain. From the steps you’ll admire a scenic panorama both of the village and the surrounding hills. You’ll get soon to the second square of Arqua Petrarca, Piazza San Marco, where stand the Santa Trinità Oratory, built in 1181, hosting an altar piece of Palma il Giovane (Giotto School) and the 1300’s Loggia dei Vicari, decorated with the coats of arm of the noblemen from Padua who governed the town on behalf of the Republic of Venice. To enjoy a stroll immersed in nature, behind the church starts the characteristic climb up to the gardens of Monte Castello. Go back to Piazza San Marco and walk forward via Valleselle, passing the column with the Venetian lion. 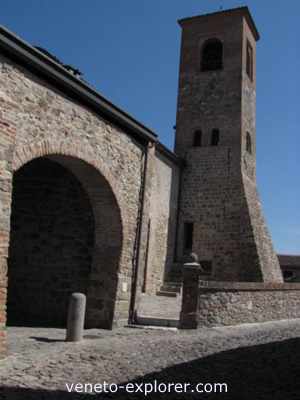 In a few steps you’ll reach the famous house of Petrarca, who lived there from 1370 until his death, in 1374. Inside the building, open to visitors, you’ll see a permanent exhibit of the poet’s works and objects (his desk and chairs, his embalmed cat, etc..). 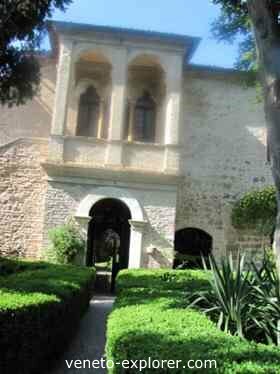 See here more details about the Petrarca's house and visiting hours. What to buy in Arquà Petrarca? The Euganean hills are a producing area of a fine olive oil. 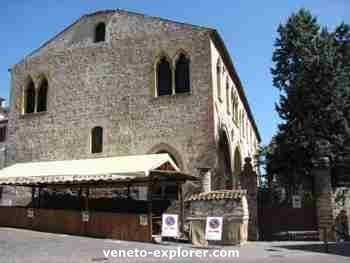 After visiting Arquà Petrarca, you may want to continue your holiday in Veneto visiting other interesting medieval towns and villages in the sweet Euganean hills. 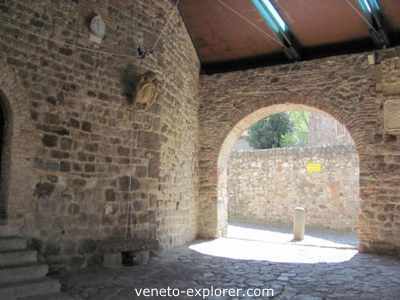 Not far from Arquà, there is Monselice, Montagnana and Este, all worth-seeing walled towns.